Known for its gently rolling hills and spectacular wildflower displays, Mt. Cuba Center in Hockessin, Del., inspires an appreciation for the beauty and value of native plants and a commitment to protect the habitats that sustain them. 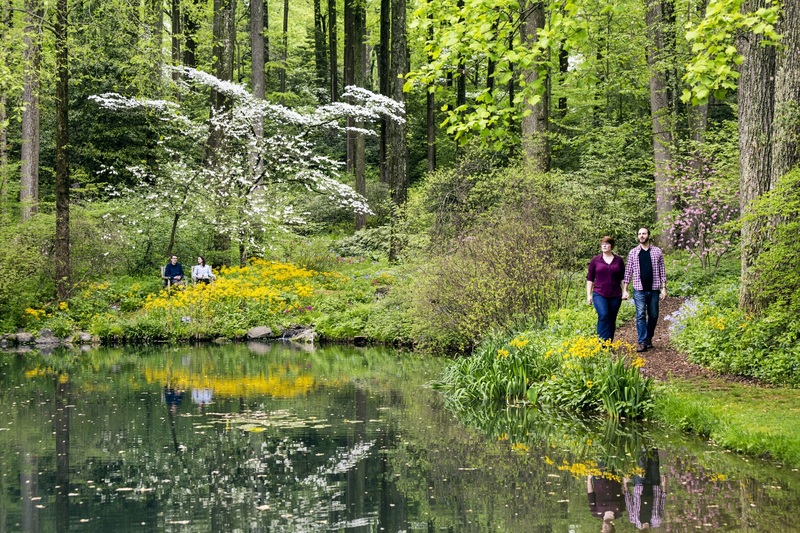 Join Adkins Arboretum on Wed., May 1 on a day trip for an in-depth look at the gardens and natural lands and to learn about notable native plants. The former home and family estate of Lammot du Pont Copeland and his wife, Pamela Cunningham Copeland, Mt. Cuba features a stately Colonial Revival manor house built in 1935. Over time, the Copelands transformed the estate’s farmland into lush botanical gardens featuring some of the region’s most beautiful natives plants. In the 1960s, the couple became acutely aware of a changing ethic and thus became more concerned with ecology and the need for conservation. 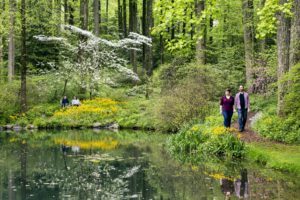 In response, noted landscape architect Seth Kelsey was hired to develop the woodland wildflower garden with native plants and to design the site’s ponds and many woodland garden paths. The site also includes formal gardens, trial gardens, a meadow and a dogwood path that radiates with spring blooms. Trilliums, the star of the season, are expected to be in bloom. These rare and beautiful wildflowers grow in drifts at Mt. Cuba in early to midspring, producing a range of peculiar smells—from sweet to stinky—that attract many different pollinators. Trilliums have three petals, three sepals and three leaves and come in a wide range of colors, from pure white to lemony yellow to deep maroon. The gardens at Mt. Cuba Center include every trillium species native to the United States. Tickets are $95 for Arboretum members and $120 for non-members. The fee includes transportation, driver gratuity, admission, a docent-led tour and a gourmet boxed lunch. The bus departs from Aurora Park Drive in Easton at 8 a.m. with additional stops near Wye Mills and Chestertown. Return time is approximately 5 p.m. Register at adkinsarboretum.org, or call 410-634-2847, ext. 0 to reserve a seat.